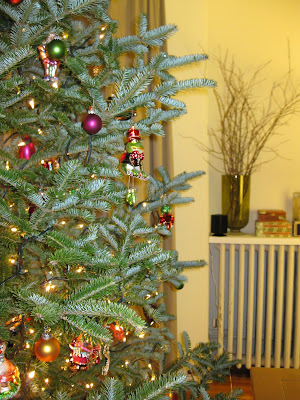 everything LEB: Got My Tree!! 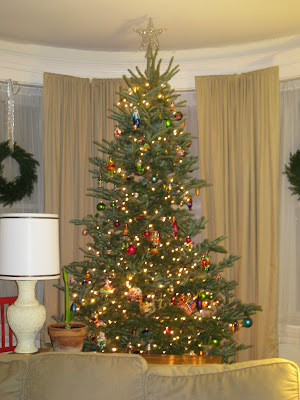 My Christmas tree is finally up with lights on and decorated, Christmas season is finally in full swing!! 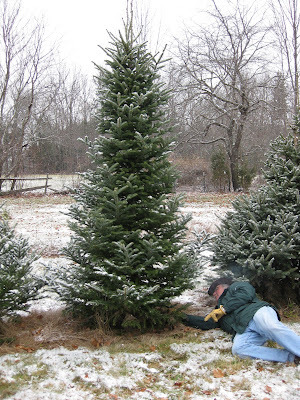 This weekend the BF and my parents went up to Hampton Falls, NH to Tonry Farm to cut down our own tree. I love cutting down my own tree because 1. it lasts alot longer then a tree already cut and 2. half the fun of getting a tree is looking for it yourself in the woods and then cutting it down. I normally would be pro "live" tree (one with a root ball that can be planted after) but they don't make those readily available in the city, and then the issue of where I would plant it when Christmas was over. So, Tonry Farm is a great place to go because they put their land in a Conservation Easement, meaning it will never be developed and will stay a farm forever- yeah for local farmers! I forgot to take pics of it up and not decorated because I was so excited to just get started. Here it is all finished and pretty!! 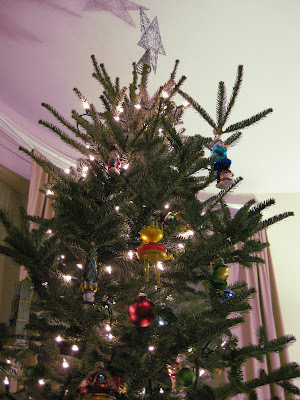 The tree was a perfect fit, ok well actually I had to trim a bit from the top for the star to fit...but it just reaches our 9+ foot ceilings- yeah for a big tree!! Some of my Christopher Radko ornaments on the tree. So pretty!!! 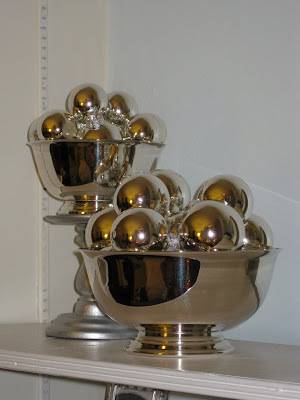 I LOVE the silver bowls!! Such a beautiful tree and the bowls are gorgeous as well! Thank you Kay, Lauren and Dolcechic! I'm pretty excited to have it up and done, it was alot of work. But now that its up I'm loving it! LOVE the tree, and love how your dad helped cut it down, it's a cute picture. Your house looks amazing and I wish you would have a Christmas Party. I will wait for my invite. Very cute! I have to restrain myself with the Paul Revere bowls...I buy them EVERY time I find one.